The Bangalore based startup has launched it’s first smartphone in the Indian Market and wants to make a mark with it’s new flagship ‘Mark 1’. 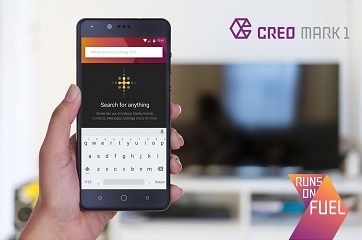 As per CREO, the software is the main focus for the startup and and as such comes with all the hardware bells and whistles, but the main focus for the company is the software. The phone comes with what the company calls FUEL OS, which is based on Android. Another really important feature is ‘Sense’. As name suggests, ‘Sense’ is a universal search engine that can find anything on the phone and can be evoked by a double tap on the home button, Echo, which is a voicemail service of sorts that can work with any carrier, Moreover, the Retriever will notify you through an email if another SIM is inserted in your device. Also included feature is smart forwarding which means that calls will be forwarded from one SIM to another one if unreachable. There is also a notification manager, and seperate SMS inbox for messages from people and businesses, with quick reply and copy OTP functions. So, this device helps in keeping business separate from personal life. What’s new about the Mark 1? As per company’s claims, ‘A New Phone Every Month’ is the main highlight for Mark 1. The company will be releasing new updates each month thereby adding new functions every month. Moreover, the updates will be based on the feed back received from users and according to the user’s needs. Hence, you will be informed of all the changes before you install the update. The company wants to have a long lasting relationship with its customers while setting up a countrywide service network of 106 centers in 96 cities (set to increase to 300 centers in 150 cities in the coming months). Moreover, there will be pick up and drop service in 15 cities. You can also chat with the customer service by typing “CREO Support” in the aforementioned Sense.